Miss Sadie, the Cowboy and I had pressing business in Charlevoix today. Nevertheless, we made a detour along the ribbon road to the top of the second ridge, parked the car next to the centennial barn, and fled into the afternoon. First we exchanged pleasantries with Sue Swain, who was working away in the wee cobbler’s shop but not averse to a little break. 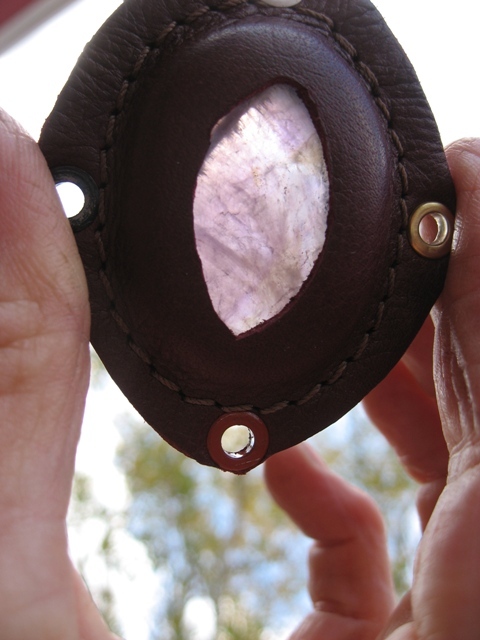 She showed me a stone that was probably an agate, but reminded me of the story of the “peek stones” that revealed his destiny to James Strang. He rose to become King James I of the Mormons of Beaver Island – and fell to an assassin’s bullet. That reminded me of Reuben T. Nichols, who was with Strang on the Island. Reuben is not properly speaking one of my Civil War veterans, but he knew them, and baptized some of them, and married some of them, and lived here in the Township, homesteading along a road that still bears his name. I tried to tell these stories to Sue and garbled them badly, but she was encouraging. It will all come right when I write it . . . and edit it . . . and edit it some more. Just now I see it as through a peek stone, dimly. Miss Sadie, the Cowboy and I trotted off along the lane that borders the back forty. We have had just enough late summer rain to green up the grass, and just enough sun to set a yellow maple on fire. Dark grey clouds hung low over the fields. Near the corner that leads to the cemetery where Reuben T. Nichols and his wife Mary White DeMary are buried, an ancient ruin of a tree contemplated the glory. It reminded me of a tree in Mrs. Uhdd’s Derbyshire, struck by lightning, shorn of its branches, and putting forth green shoots in defiance of all odds. Perhaps it knew my Civil War veterans too—or rather, was known by them. Perhaps it was a witness tree, marking the corner of Dan Blakely’s homestead. No matter. Today it marks the pumpkin patch. At another corner an old apple tree lingers. It seems too far from the farmhouse to be part of an orchard. Could it go back further, to an Indian garden not marked on any survey? I suspect myself of romantic fancies. The tree probably grew from a seed planted by an errant robin sometime in the last century. Probably. Maybe not. It was a long time ago in any case, and yet it lives, bearing, even in this year of odd weather, a crop of shiny red fruit. 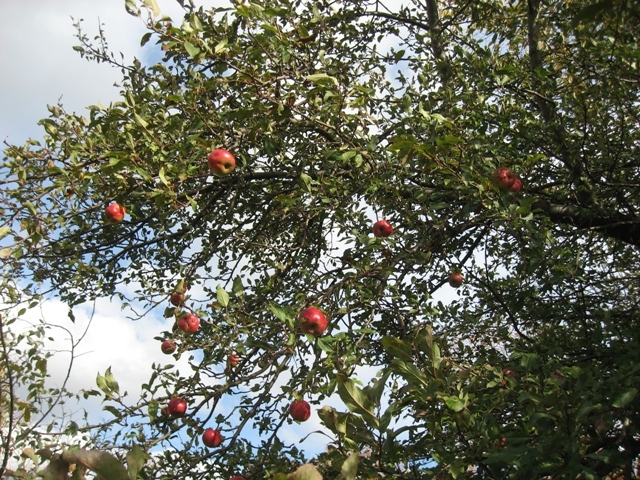 The Cowboy disappeared into the underbrush, going after the windfall apples. He ate so many he has a tummyache now, but I am not sorry for him. Miss Sadie took off in every direction at once, pretending to be a horse, galloping, galloping in the wind. Back in the pasture the real horses—Malika, Monty and Joe—were unmoved by Mama Nature’s Big Show. They browsed in lush grass. Joe stood near the fence, looking casual, all his weight on three legs, holding the fourth in reserve to lash out at errant spaniels. Monty whuffled notice that he and Joe were on the case. Miss Sadie and the Cowboy pretended to ignore the horses. The horses pretended to ignore the dogs. I pretended to understand more than I do. Just in time we remembered our mission in Charlevoix, and managed to get there before the bank closed. The teller was very nice, much nicer than I might have been in her position, dealing with a last-minute customer as twilight gathered on a Friday evening in October. It’s astonishing how a little kindness like that can make the difference between a person feeling like a valuable human being or feeling like whatever Miss Sadie might have rolfed up after galloping through the woods. We brought our valued selves home and had one of the pasties for supper. I know, I know – I said I was saving them. Apparently I was mistaken about this one. It was delicious. Quite a feast you’ve laid out here. I was at least right about the seer stones. “Urim and thummim”, I thought, and there was the connection. I read the whole wiki, and was amazed in several ways. I’d forgotten a good bit and didn’t know even more. Beyond all that, I learned that, over the centuries, Lake Michigan has ranged over a differential of 375′. Someone around here mentioned the Lake is low now – I thought this tidbit from a Beaver Island site was interesting: “The Lake dropped to a very low level about 8,000 years ago, and stayed down for 4,000 years.” It seems Beaver Island wasn’t, always. Patience, patience…. The color on those trees is spectacular. It makes me want apples, and pumpkin bread, and real cider. Well, and I could use a seer stone, too. It was a fine afternoon for looking at trees, with or without the miraculous stones. I love following the trail at Maple Bay nature preserve as it descends three distinct benches toward the lakeshore. It makes geologic time almost comprehensible. You have beautiful countryside…and horses and I suspect dogs too though they photos did not appear. Glad the teller was nice to you. You got a special one…most of us bankers are pretty cranky by the end of the day on Friday. But we shouldn’t show it. Glad you enjoyed the pastie too…bet it was even better than good. Your writing makes me smile…’fled into the afternoon’ made me smile wider. What a great line. You’re right – Miss Sadie and the Cowboy are the merest specks on the lane. I must take their pictures soon or they’ll be crankier than a banker on Friday afternoon. 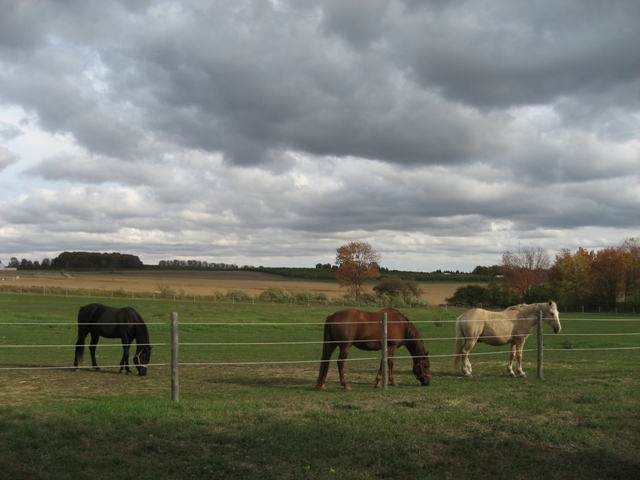 Gorgeous photo of the horses under that sky…. I see you look a lot like us- still- even tho the terrific winds from the west huffed and puffed and tried to tear all the leaves down. Getting our wind? You might smell brats and cider and popcorn. Fall festivals are all about here. Thank you. Those horses are quite photogenic. We’ve been having gusty weather though it’s still mild. 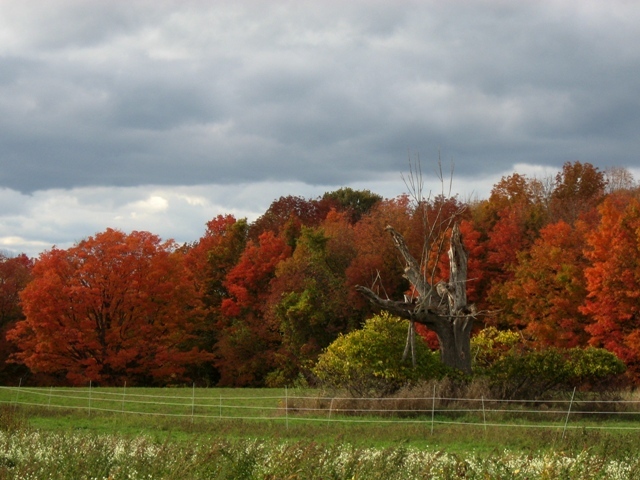 Heading into fall festivals here, too – the seasons are turning fast now. What a lovely afternoon for you and the duo. 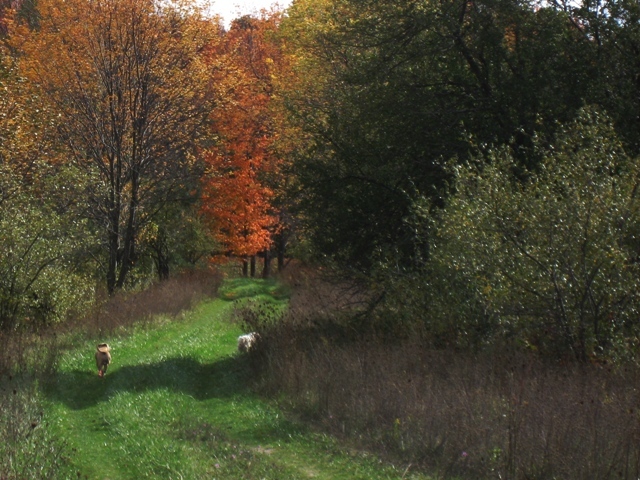 I love the shot of the trail with the dogs galloping into happiness. I am too chicken to trust my duo off the leashes. We recently discovered that Daphne, too, enjoys apples when my daughter offered her a few bites from her mostly eaten core. Teddy, however, like many men and boys, does not consider fruit or vegetables to be actual food. I am very careful about where I let them off leash. Life is full of hazards and the Cowboy is just the one to find them. He thinks everything is food. I’m suffering from tree envy now. You have some pretty spectacular trees of your own. They are wonderful things, aren’t they. We have a history Around Here of thinking of them as a crop. Someday I’ll have to post some photos of the Township circa 1900. No trees. Just stumps. Oh the trees are so beautiful. I’m glad you posted pictures of them. I have some family that live in Cheboygan and they are always saying how pretty the colors are but no one ever sends me a picture. Your family members are probably modest people who don’t like to show off. I am a show-off. Glad you like the trees. The colours are lovely Gerry. There’s nothing like a walk with dogs, is there ? You mean other than being dragged cross-country by stampeding horses? Nope. Nothing. You weave tales of historical facts among the fields and trees of today. A lovely yarn during a lovely time of year. PS Nice to see you back, Gerry! Thank you, Scott. It’s good to be back. Also good to be in autumn.